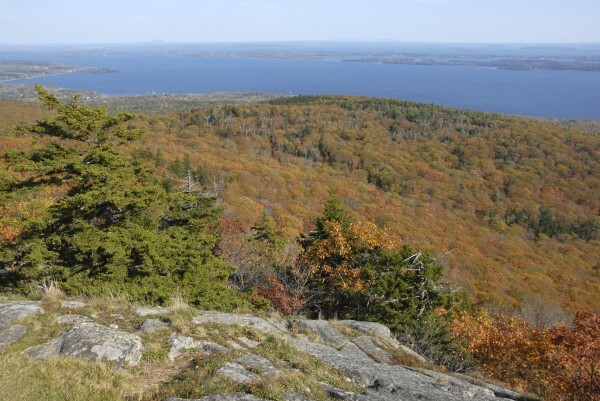 From the summit of Bald Rock Mountain in Camden Hills State Park, the fall foliage extends across the Lincolnville hills toward Penobscot Bay in this October 2013 file photo. Maine families will have the opportunity to enjoy the outdoors with a little help from the State Bureau of Parks and Land, the Harvard Pilgrim Health Care Foundation and the state’s Let’s Go! program this summer. In its third year, the goal of the passes is to introduce Maine families to the outdoor activities available through the state parks system, Dr. Victoria Rogers, Let’s Go! director, said in a release. A total of 10,000 passes will be available through the 124 medical practices that participate in the Let’s Go! program. The passes are good for free admission at the 48 state parks and historic sites in Maine through December 2014. Baxter State Park is excluded though. Let’s Move! is a nationally recognized childhood obesity prevention program. The program, which promotes physical activity and healthy eating, will be handing out the passes for the third year in a row. The program was created to get children active and outdoors. “It allows us to talk about a healthy message, and then it allows parents to use that message,” said Dr. Jon Fanburg of Maine Medical Partners South Portland Pediatrics. He gave out 600 passes last year to his pediatric patients. “It’s one piece of a big picture of how you make people healthier,” Fanburg said. Fanburg said he emphasizes Let’s Go!’s 5-2-1-0 teaching model: five or more fruits or vegetables, two hours or less of recreational screen time, one hour or more of physical activity and zero sugary drinks, more water and low-fat milk. “We use it as a teaching point. It’s an opportunity to talk about health as a tool and reinforce it at the same time,” Fanburg said. For the Maine State Bureau of Parks and Land, it also is an opportunity to introduce families to the outdoors, according to Gary Best, Maine State Bureau of Parks and Land resource manager. “It gets them outside. It gets them active and connected to nature and hopefully they have fun along the way. That’s what Maine State Parks is all about,” Best said. About 10 percent of the 10,000 passes distributed last year were used, Best said. But he’s hopeful that number will grow this year. For information about the Let’s Go! initiative, visit www.letsgo.org.